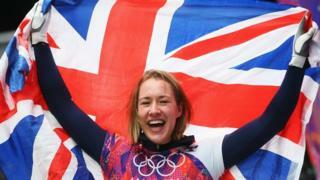 Britain's Lizzy Yarnold slides to Olympic gold in the skeleton at the 2014 Sochi Games. The 25-year-old from Sevenoaks completed her four runs in three minute 52.89 secs, 0.97 secs ahead of silver medallist Noelle Pikus-Pace, with Russia's Elena Nikitina taking bronze. Yarnold's victory means Britain retains the Olympic title won by Amy Williams at the Vancouver Games in 2010.